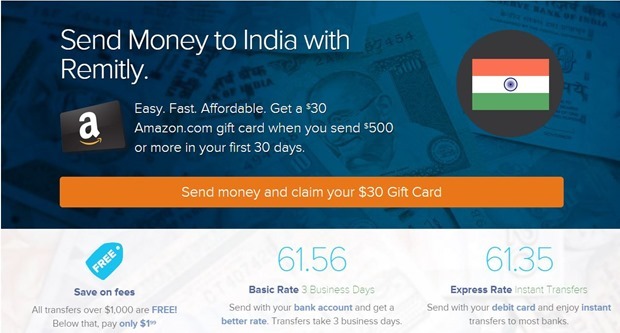 Jeff Bezos backed Remitly has started offering remittance services from USA to India, and has ignited the $11 billion market with aggressive pricing and forex rates. Founded in 2012, Remitly started its operations with the Philippines market, and was among the first to introduce a mobile based platform for easy remittance. Besides Jeff Bezos, founder of Amazon, Remitly is backed by some heavy weight investors such as Trilogy Partnership, QED Investors, Founders’ Co-Op and Tomorrow Ventures and currently remits close to $100 million every year. In USA, Remitly is authorized to send money across 41 states and their new mobile friendly interface eliminates forms, agents, codes and middle-men from the transactions. If we observe today’s forex rates, then Remitly is offering Rs 61.56 for every dollar, which would be transferred within 3 days. For express delivery, which takes only a few hours to get transferred, they are offering Rs 61.35. For all transactions above $1000, there are no service fees, and below that, they will charge $1.99 or Rs 120 for every transaction. However, some Government banks in India are offering higher rates than Remitly right now. However, the conversion charges are added as well. Some of the major players in the lucrative USA to India remittance market include Kotak Mahindra, HDFC, Axis Bank, ICICI, Citi Bank, Remit2India. In India, Remitly has already partnered with leading 120 banks for facilitating the transfer instantly. They have introduced a unique ‘delivery guarantee’ as well, according to which the service charges and the money would be reverted incase of any delay in transferring the money. Under Instant Direct Deposit, NRIs can instantly transfer money from USA to India 24 hours a day, and this service is available for leading banks including ICICI, Yes Bank and PNB. Under some exclusive tie-ups, 4 hour delivery is also available, only for Indian customers. India is the country which receives maximum amount of remittance from foreign countries. As per World Bank’s report, in the year 2013, India received $70 billion remittances from all over the world, an amount which beats China, Philippines and Brazil, which are other huge acceptors of remittance. Around 30 million Non-Resident Indians sent $70 billion to India, which amount to approximately 4% of country’s GDP. Money transfer from USA to India is counted among the highest remittance corridors globally. As per World Bank’s report: Migration and Remittance Flows: Recent Trends and Outlook,2013-2016 USA to India remittance stood at $12 billion in 2013, which will rise to $15-20 billion by the time 2016 ends. Here is an interesting graph showing remittances received by India in last 3 years. Mohul, it is great to have Remitly expanding destinations, but USA-India is one of the most competitive corridors globally and Remitly, so far, is NOT one of the least expensive providers. Several large money transmitters are already charging less than 1% for FX markup; the fees are also declining – several providers charge less than $5 for sending $0-3K from a bank account. Mohul, why did you leave out providers with much better FX rates: WU, MG, TW, Ria, WallMart, etc.? They all beat Remitly and have much larger market share especially first two… in the future, you could check out sites with all rates comparison information first: SaveOnSend.com, CompareRemit.com, etc.